I’m meeting a 5’2 Baldwin Hamilton in El Cerrito today, Sunday, and I’ll videotape the introduction for posting on You Tube. The buyer lost her “case” in court, but the exotic seller eventually got slapped with a hefty fine by the Feds for smuggling ivory into the country. He figured the elephant tusks would entice interest in his “rebuilt?” Bosies (Bosendorfers) among other imported inventory. Amen, to this fellow who had the courage to publicly post the Truth at my blog site. 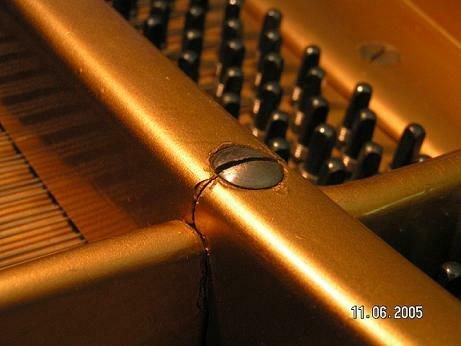 It was definitely a red flag for those captivated by a brand, without a necessary in-depth inspection of a piano’s interior by a capable technician. Now given all the exposure I had to this particular seller who pitched a dubious description of the PROKSCH to a prospective buyer in Fresno, I had promised myself never to rely on AT and T or anything resembling, to choose a piano. Yet circumstances required an imminent replacement of a teaching instrument (not mine) that was at death’s door, and the phone, being within easy reach, was a tantalizing option. 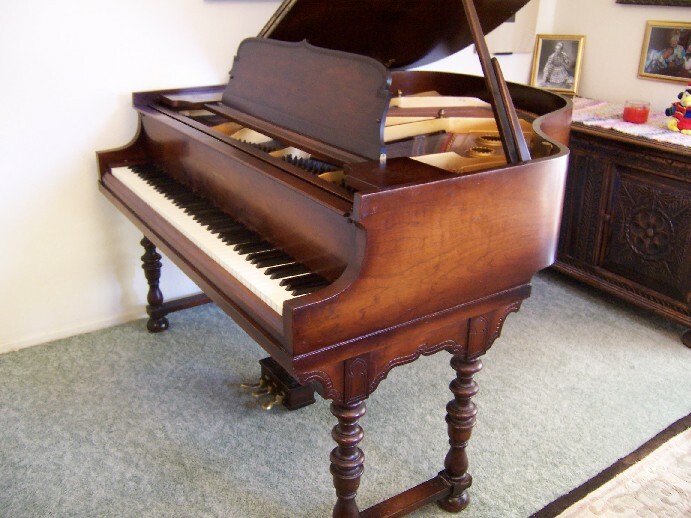 The piano that piqued my interest, sat in the seller’s living room in Arroyo Grande, California, on the Central Coast. 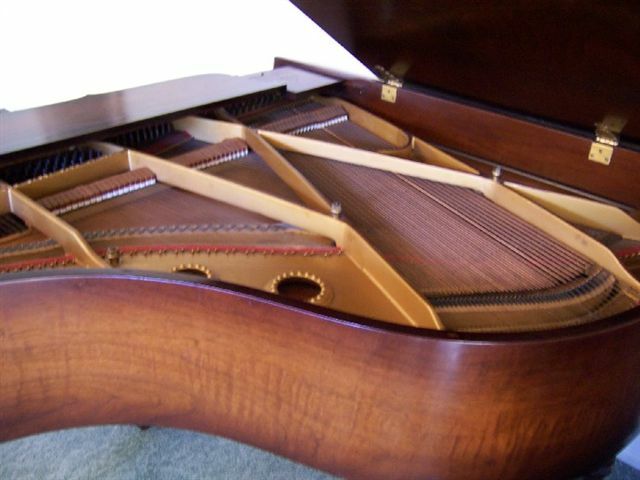 While a technician was selling it, he was NOT the original owner, and in any “case,” how could he be unbiased about a piano that embodied a profit by its sale. As far as I was told, the piano had a University-based history. Well, supposedly it bore a sticker with a Cal Poly inventory number. An educated piano, perhaps? Tonal implications? Who maintained the piano? The seller suggested that a fellow named “Richard Cummings” might have worked on it. Apparently, this regaled R.P.T (Registered Piano Technician) was one of the elite piano masters of Arroyo Grande. And from what I learned, he had relocated to Missouri in his retirement years leaving behind a following of fine piano owners. I knew how it felt to lose a cherished technician. The aftermath could be of tragic proportion. In 1989 my Steinway M, 1917 grand catapulted into crisis after a local tech “polished the knuckles,” and “filed the wippens.” He even “brightened” the treble, unauthorized transforming my life partner into a virtual stranger. To spare readers all the gory details, suffice it to say, that the piano barely survived an onslaught by more than one tech in a parade of them. In fact, my dearly beloved nearly died before its miraculous Resurrection through life-saving efforts of a Modesto-based SAVIOR. Through a bit of Google-driven research, I had found the canonized Richard Cummings with God sent contact information. 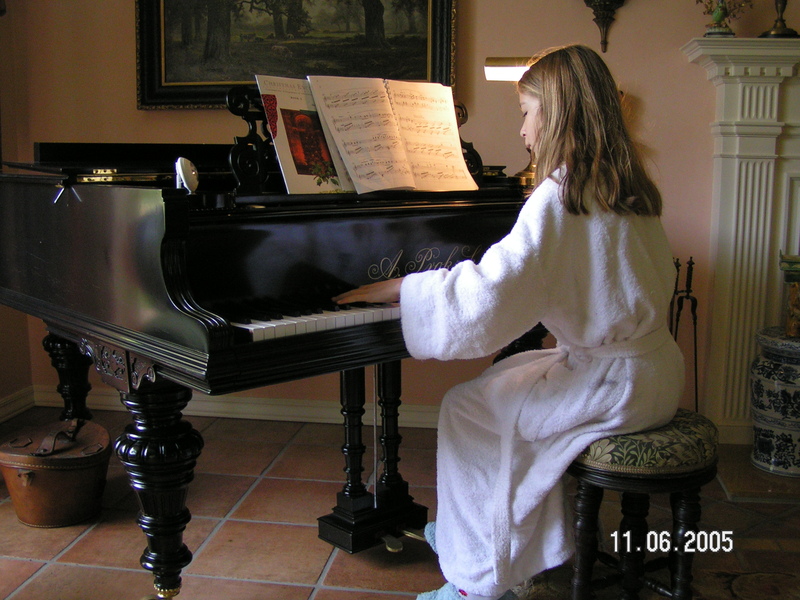 In an e-mailed reply to my lengthy diatribe, he confessed openly that he never worked on my “newly” purchased piano, but had a fresh “lead” for me. So like a dog sniffing a bone buried deeply in the ground, I began my hunt for “Beverly” in “Arroyo Grande” and found an amiable woman speaking to me by phone about a piano she admitted was not one of her babies. The tuning landscape sounded all too familiar. Here in Fresno, I could count one GOOD tech on my pinky, and that number was shrinking into the negative zone…. 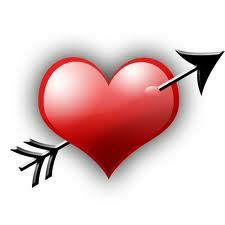 Okay Enough speculation and hand-wringing about my blind date. JUDGMENT DAY is later TODAY, so I’ll have to wait patiently for the verdict. Meanwhile, Stay tuned… I’ll be back Tuesday well after my tryst with this intriguing piano. Piano Interviews by Phone, Don’t Copy Me. I had one of these little Baldwins for a while, of similar vintage. It was not a good piano. I know some people love Baldwin pianos, but they are not my favorite. Thanks for sharing.. without giving away the results of my blind date, suffice it to say, that my playing experience was awesome…and therefore, each piano must be adjudged INDIVIDUALLY. I think readers will enjoy the whole “move” and reception of this treasure, as it all happened yesterday. Since I am still in El Cerrito, I won’t have the footage posted until late tomorrow, Tuesday.